Excavators rumbling across China are digging a way out for the nation's continued economic growth. As a metric of the country's infrastructure sector and real economy, hot sales of this type of heavy equipment signal a construction boom and an upswing in fixed-asset investment. Industry observers said the trend supported GDP growth amid downward pressure in 2018, and this is set to continue this year. 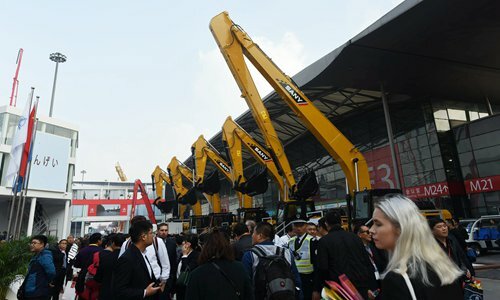 Excavator sales in China last year grew about 41 percent to 184,190 units, breaking the sales record of 178,400 machines set in 2011, according to a statement that the Excavation Machinery Branch under China Construction Machinery Association (EMBCCMA) sent to the Global Times. The number was calculated based on figures from 25 major Chinese construction equipment makers. In January, a traditional slack season for the construction industry, sales of excavators rose about 6 percent, Li Hongbao, secretary-general of EMBCCMA, told the Global Times on Thursday. Leading heavy equipment manufacturing company Sany Group is feeling the sales momentum. In the first two working days since the Spring Festival holiday ended, the group sold about 200 excavators, a manager of the company told the Global Times on condition of anonymity on Thursday. "Clients don't haggle over prices anymore. They pay quickly and they're more interested in how fast they can get the excavators," the manager said. Last year, Sany sold 47,000 excavators, a new record that gave it a share of 23.1 percent in the Chinese market. As demand rose, Su Yangjian, an owner of an excavator leasing company in Ningde, East China's Fujian Province, bought five more excavators last year, taking his inventory to about 50. "Demand was up by 30 percent last year, at least. At peak times, it was tough to keep up with demand," Su told the Global Times on Wednesday. He is also bullish about growth this year as projects speed up. Clients "swarmed into" his office immediately after the Spring Festival holiday ended, he said. What's bolstering Su's confidence is a construction revival in the third-tier coastal city, as well as much of China. Su's clients are deploying excavators to build highways, railways, an industrial park for electric battery-maker CATL and an auto plant for state-owned SAIC Motor. All such projects, based on a local government plan, involve investment as high as 579.2 billion yuan ($85.49 billion). "Amid an economic downturn and global uncertainty, trade could suffer and consumption may be weaker, but investment, especially fixed-asset investment, could outweigh the two factors to serve as the main driver of China's GDP growth," said Cong Yi, a professor at the Tianjin University of Finance and Economics. Excavators - a necessity for infrastructure projects - are widely seen as a barometer of China's economy. "They are not digging dirt… they are mining 'gold' for the economy." Cong joked. In 2018, fixed-asset investment rose 5.9 percent year-on-year. Nationwide, the National Development and Reform Commission, the chief economic planner, approved 189 fixed-asset projects in the high-technology, energy, construction and hydraulic engineering sectors in 2018. The country also put into service 4,100 kilometers of high-speed rail lines and opened six more civilian airports. Su, who has been working in the construction machinery industry for about a decade, said he did not feel a freeze in the domestic economy as some Western media have boasted. Rather, he can tell that China's economy is tilting toward a healthy growth model. "Excavator demand in the real estate sector is sinking, while the machines are used more effectively in projects that expand factory capacity or infrastructure construction, which lays a foundation for an economic takeoff," he said. There is also plenty of scope for investment that could cushion the economy against downward pressure in 2019, according to Cong. "Chinese policymakers are advancing the rejuvenation of Northeast China, the plan to boost the country's western region, and regional integration, which will create massive demand," Cong said. Under a decision by the National People's Congress announced in late December, local governments are allowed to borrow up to 1.39 trillion yuan in 2019, the Xinhua News Agency reported. Analysts said this policy will enable local governments to issue bonds for infrastructure project financing.